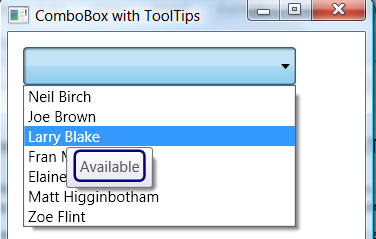 In this article, Ged Mead demonstrates an easy way to use WPF and Windows Forms Interop to create and use a ComboBox that displays ToolTips for individual ComboBox items. Murach's ADO.NET 3.5, LINQ, and the Entity Framework by Anne Boehm, comes in both Visual Basic and C# 2008 versions. Larry Blake reviews it. In the previous articles in this series, we covered basic Constructors, Fields and Properties. In this article, we will look at the ToString method, introduce the concept of Inheritance, use the Object Browser and learn about Overrides and Overridable.